Why do you guys create problems and issues where there aren't any? Now cars that sitting are going to be hit and damaged, like Mercedes or any other overseas brand doesn't know how to store cars before sale? Just wow. You guys create your own issues and then worry yourselves to death over them. Most of the cars that sit are wrapped anways. Much abo about absolutely nothing. Cars that sit at the port should automatically be discounted? Ridiculous. for the record, the only thing I’m bunched up about is waiting to get it. Past that, to me it’s like buying a car off the lot.... I will surely check it out and test drive and make sure stuff works but I’m not going to use an electron microscope to inspect every square inch. Sometimes the plastic exterior cover adheres to the panel too much, particularly if the car sat around too long with the covers on. The folks at the dealership aren't typically too gentle with those, they just tear them off. Most of the time, it turns out ok, but my brother told me of cases where there would be some de-lamination of the clear coat from the underlying paint. When the car is washed in preparation for customer pickup, moisture is formed under the clear coat in the area that got de-laminated. The trick to hide it is to use a hair dryer on that area. It makes the problem disappear temporarily, so the customer doesn't notice it when picking up the car. I get that, it's normal to do this. Damage happens, but this about getting an automatic discount is just plum ridiculous. Like I said before this is much ado about nothing. It is not the norm and your posts serve no purpose other than to worry the hell out of people who are already nervous/anxious about waiting for their cars. Horror stories are a dime a dozen. Why don't you just do European delivery then. You're talking about dealership damage now, not port/VPC damage. Of course things happen at the dealer. You act like MB is the only one with dealerships. Imagine what goes on a at Ford or Chevy dealer with cheap cars to start with. 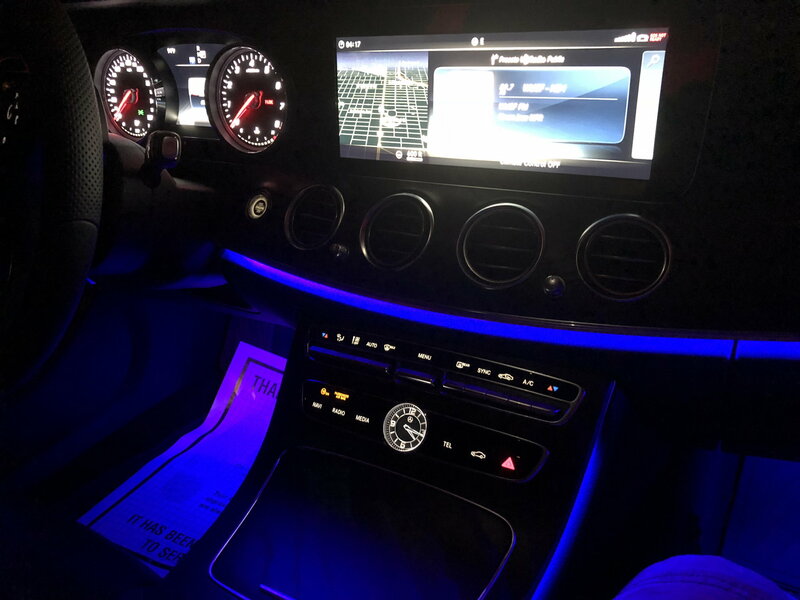 I always inspect a new car using an alternative light source. There was a thread here from long, long ago by RickInHouston that described the process that he went through with Mercedes to get a new car of a different model. Exactly my thoughts as well. I know the cars at the VPC are wrapped. before being sent to the dealership. I wouldn't hesitate to buy a car that sat there for a couple months. The only reason I've ordered a car is the inability to find anything left at this point, pretty much anywhere with the options I want. So........I'm not getting the E450 afterall. 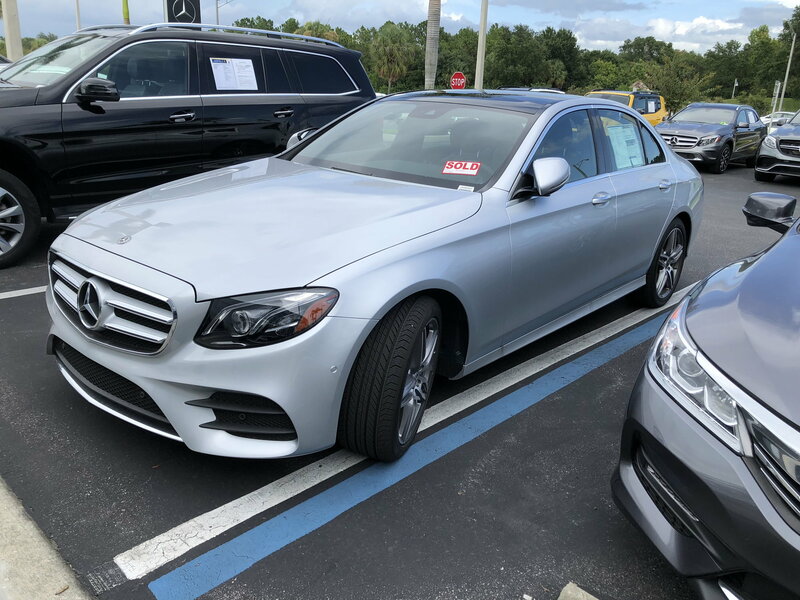 My dealer and I have haggled all morning over an E400 they have on the lot that has most (not all) options I wanted. No, I'm not getting the fancy all digital instrument gauge screen, but TBH, I can live without it. They wound up offering me a deal I just can't refuse, with a hugely significant discount off MSRP. it's Iridium Silver (a color I like to begin with), with black leather seats and natural grain black ash trim, including the center console. It has the P2 package (as mentioned, without digital intstrument cluster), ventilated seats, panoramic sunroof, 19" AMG wheels, air balance system (which I don't really care about, but it's on it), trunk box (what they call comfort box?). Pretty much all I gave up from the build I would have gotten was the 360 camera system and the self-driving distronic system, which I likely wouldn't use, even if I had it. 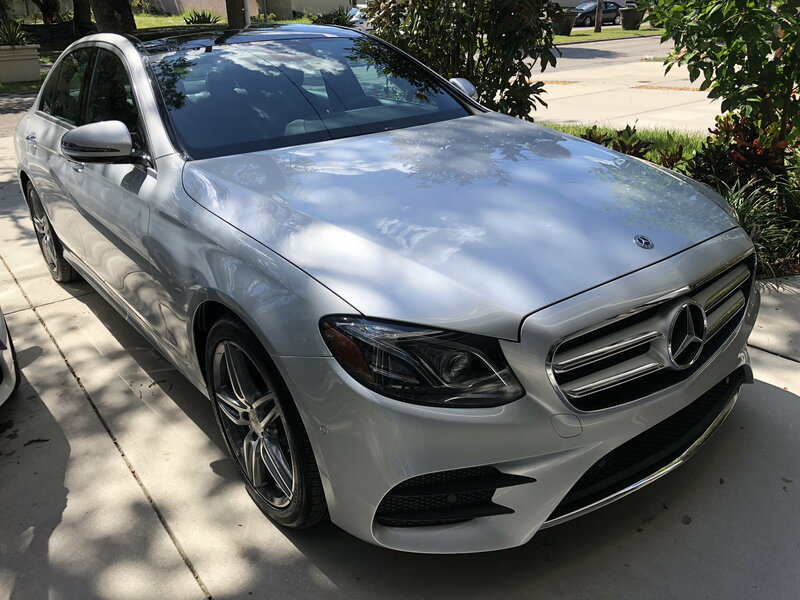 I have driven an E400 and TBH, even though the E450 has more power, the E400 was beyond enough power for my driving needs. This really came down to a financial decision. Turns out having a fully loaded C300 wasn't a very good investment. The value they put on my C300 was less than they gave us for the GLC300 we traded in last weekend for the E300. The sales manager, simply made up for it, by discounting the car to offset what the used manager offered, so I'm fine with that. I haven't driven it yet, but I will take it around the block when I get off work and take a pic. Oh and it has a Spoiler. I hate the spoiler. They said they can easily remove as it's simply on with double sided sticky tape, so I'm having that removed. It will go to the tinter tomorrow and I'll pick it up Saturday. Then we're completely done with new cars for the foreseeable future and I can go back to work (note: buying two new cars in one week takes ones attention away from work BIGLY). Thanks. Is the E450 Sedan going to replace the convertible or be in addition to it? I'm sure I'll be very happy with an E400 for sure. Yes, the E450 is going to replace the E400 convertible. MB has graciously decided to take back our vehicle. The agreement which is progress, has been handled very professionally to date. Does that mean you were having issues with the convertible? Last edited by haibieb; 08-02-2018 at 02:47 PM. OK.....They took back a CLK500 Cabriolet I had once, which was a disaster and it was very amicable too! @rbrylaw I went from a C300 to an E400 earlier this year, it is a huge upgrade and I think you'll be very happy. Mine has the spoiler too and I hate it but mine is leased so I can't take it off! Enjoy your car!! I'm sure the E450 will be marginally better performing but if you got a good deal and instant gratification I don't think you should second-guess your decision at all. Thanks!! It looks like I'm getting the spoiler whether I like it or not. My dealer called to say their afraid of damaging the paint removing it. I guess I can get used to it. It's not that honking huge after all. I'm glad to know you like the transition from C300 to E400. I'm sure I'll be really happy with it. I'm in a position where I can pay outright for the car and won't have a car payment on either the new E300 or E400! On the instant gratification. I suppose that has a lot to do with it. That and the financial aspect weighed heavily on my decision. Yes, I would have gotten more toys on the E450, but I was also looking at spending thousands more than what the final price of the E400 turned out to be. Ultimately, I had to listen to the value of diminishing returns. The discount they offered was stunning. Maybe the sales manager was simply tired of my constant querying about the E450 and build dates, etc. LOL But he's the one (not my salesman) who called me this morning to offer this option and suggest I take him up on it. Last edited by rbrylaw; 08-02-2018 at 04:15 PM. For future purchases stick with that sales manager he will become your best asset. I've been with the same dealer since the 1960's. Loyalty pay huge dividends - financial and otherwise. I've been with him and this dealership for over 20 years and more cars than I can count. He ALWAYS takes beyond outstanding care of me. I got the new E400 this afternoon. I'm so so so pleased with the engine and it's just beyond my expectations. I'm made peace with the fact I didn't get the all digital instrument cluster. 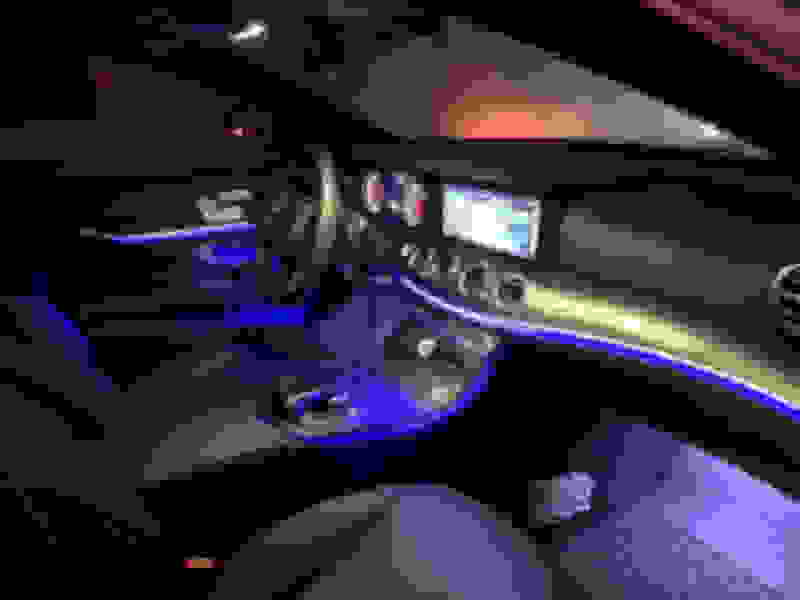 And TBH, the analog cluster is very nice looking and provides all the info you need, which is to tell you how fast you're going, your RPM and other assorted tidbits of information. Here are a couple pictures. Since in one week, we've become a two E Class house, a couple pics of the E300 and E400 side by side! 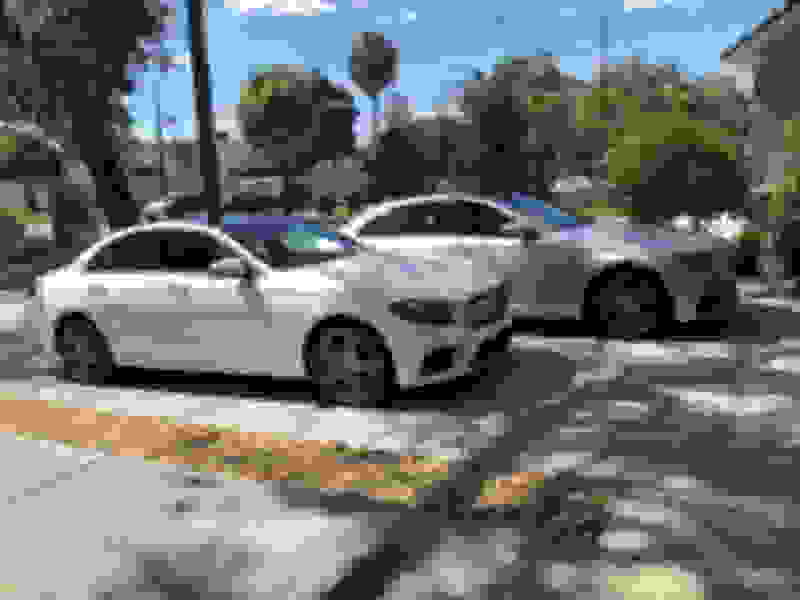 The E300 Polar White is on the left. The E400 Iridium Silver is on the right. Thanks and it's nice to see you. 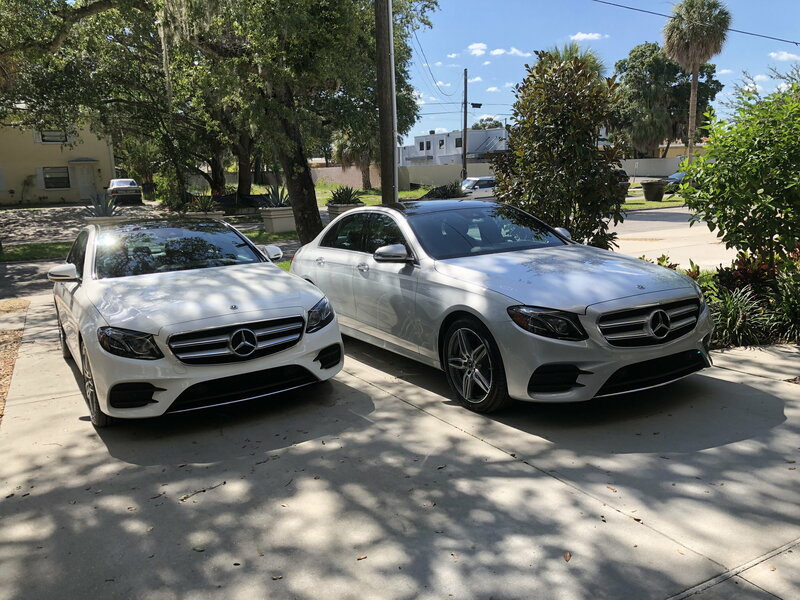 We traded the GLC in on the E300 last Saturday. We would have actually considered a new GLC, but even for the 2019 model year, you can get Comand or Apple Car Play, but not both. Hard to fathom, but that's how it is.